“Water is the driving force of all nature”- Leonardo Da Vinci. 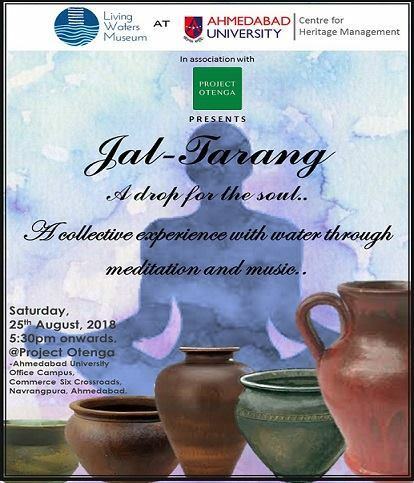 The Living Waters Museum, an emerging digital platform on water heritage and the arts, and the Centre for Heritage Management, Ahmedabad University, in association with Project Otenga Cafe, presents “Jal Tarang”. An evening dedicated to re-discovering the connection of water with our souls. Come enjoy a collective experience of meditation and music and embark on a personal journey to look at the role of water in our daily lives. Join us in a water orchestra and explore the sounds of water yourself. Ahmedabad University Office Campus, Commerce Six Crossroads, Navrangpura, Ahmedabad. Doors open at 5.30 p.m. Entry limited to first 30 people, no entry fees. 6 – 6:15 pm: Inauguration music by Chetan Dixit and team ( students at the Centre for Heritage Management). 6:15 – 6:30 pm: Welcome remarks by Dr. Sara Ahmed, founder, Living Waters Museum and Ms. Kavya Sum, founder Project Otenga Cafe. 7:00 – 7:40 pm: “ A drop of music”, a water jam with the audience led by Mr. Sukrit Sen, post-graduate student and musician, Centre for Heritage Management.